Island Home for Thanksgiving — SSA adds extra service to accommodate holiday travel next week. Steamship Authority governors Tuesday awarded a bid for a $2.6 million temporary modular terminal building in Woods Hole, another early step in a large reconstruction project at the Woods Hole facility. Triumph Modular Inc. of Littleton won the bid to provide the modular building, which will be located on the side of the car staging area; the building will be in use for six years while the new terminal facility is under construction. Triumph was one of three companies to submit bids, and while it was not the lowest bidder, boat line general manager Wayne Lamson said the company was recommended based on its understanding of the project. The building must be ready for use within a year; under the proposed schedule it could be completed as early as June 2017. Governors also briefly discussed whether any nonprofits or other organizations could take the modular building once it is no longer needed by the Steamship Authority. “We don’t have any use for it that we’re aware of,” Mr. Lamson said, adding that the SSA could see if other parties are interested in repurposing the building. Falmouth governor Elizabeth Gladfelter said the idea came up during a meeting with town leaders in Falmouth. Mr. Lamson said they would likely have to go through a public bidding process and figure out payment issues. Plans are well under way for a complete overhaul of the Woods Hole facility, including rebuilding the ferry terminal, realigning the slips and relocating administrative offices to the Palmer avenue parking lot in Falmouth. The boat line has cleared all the licensing hurdles for the project, including from the state Department of Environmental Protection, but a group of 13 Falmouth residents has appealed that approval, citing concerns about public access how reconfiguring the boat slips would impact navigation and fishing. Mr. Lamson said a hearing in the matter has been moved up from March to Jan. 27. Over the next several months, construction will also begin on a new $12.7 million building for the SSA administrative offices, which will eventually relocate from Woods Hole to Palmer avenue. Mr. Lamson said the contractor, G&R Construction of Quincy, will be working on the foundation for the building over the next few months, and it should be ready for occupancy by the end of 2017. The three-story building will be 32,000 square feet and in addition to administrative offices will include a public meeting space and IT center. In other business Tuesday, the board approved requests for additional service from Island Queen and Hy-Line, private passenger ferry companies that run summer service to the Vineyard from Falmouth and Hyannis. The boat line is allowed to license competing ferry service. The Island Queen will run one additional trip between Falmouth and Oak Bluffs Mondays through Thursdays during its 2017 spring and fall schedules, and will begin its 2017 summer schedule one week earlier than it would otherwise be allowed. The additional trip will depart from Oak Bluffs in the morning and leave Falmouth in the afternoon. The Hy-Line will extend its fall 2017 schedule by one week, until Oct. 8, with one round-trip between the Islands per day. The board approved a $1.7 million contract with the Thames Shipyard in Connecticut for dry dock and overhaul repairs of the freight ferry Katama. Governors also approved a $634,000 contract with SKIDATA Inc. to provide equipment for a ticketing system upgrade. The upgrades include hand-held scanners and turnstiles and gates. The company provides ticketing for ski resorts and the Hard Rock Stadium in Florida. Mr. Lamson said the equipment can read various ticket formats, including from mobile devices. Not all the upgrades will take effect immediately, he said, noting that existing tickets are still good for a year. “We want to be able to get to the point of selling online and show up with your phone or not needing a reservation,” he said. Eventually ticket books might be eliminated in favor of wrist bands or reloadable cards, he added. The board also approved changes to the authority’s procurement policy meant be consistent with recent changes to state procurement laws. Among other things, new laws raise the minimum thresholds from $25,000 to $50,000 for contracts awarded through a competitive bidding process. Treasurer/comptroller Robert Davis reported October passenger traffic was up slightly, less than one per cent, over the same month a year ago. On the Vineyard route, car and passenger traffic increased, while truck traffic was down slightly over last year. Net operating income and revenues for October were both higher than budgeted, he said. In October the board approved a $95.2 operating budget for 2017, a 3.2 per cent increase over the estimate for 2016. Changes to the budget included increases in pension, health care, and pay roll expenses, and an increase in vessel fuel oil. Operating revenues next year are expected to be about $104 million, an increase of 1.3 per cent over the 2016 estimate. No rate increases are planned. 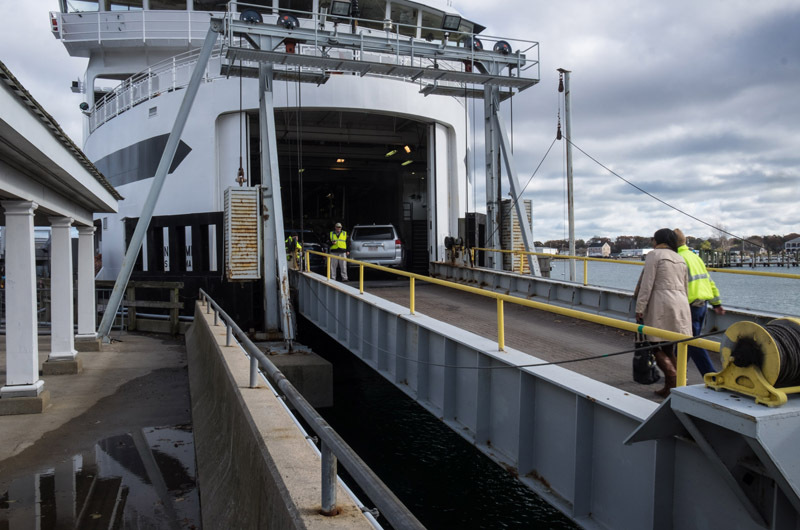 The boat line will bring the ferry Martha’s Vineyard out of repair status for the Thanksgiving weekend to run additional service for the Vineyard during the busy holiday travel period. The Martha’s Vineyard will also provide inter-Island service on Nov. 26 for the Island Cup football game, held this year on the Vineyard. The freight ferry Sankaty is expected to return Wednesday from the Thames Shipyard, where it has been undergoing maintenance since the summer. The Sankaty might also be available as a backup vessel over Thanksgiving weekend. Board members also welcomed Robert R. Jones, the new representative from Barnstable. He is the longtime Barnstable port council member and replaces Robert L. O’Brien, who was the Barnstable governor for 25 years. Six years for a construction timeline??! A project like this in Europe would be 10 Months. Whatever happened to "lifeline to the Islands" I think the cement block terminal building works great. If its not broke don't fix it. I agree, James. 6 years to construct? That's absolutely ludicrous and unacceptable. This is going to be a Big League pork-barrel project and we'll all get stuck with the tab. if the modular building, will be located in what is now a car staging area where will the cars be staging? sounds like a big mess anyone remember the barcoding fiasco a few years back. In such a highly regulated state with nonsense like prevailing wage laws contractors will stretch out the project as long as possible. A private entity unencumbered by crazy regulation could build this in less than 2 years. get ready for the cluster. Woods Hole fireworks on the 4th of July !!!!! Why can't we open keep open the Oak Bluffs terminal through December 1st. The traffic is still horrible in Vineyard Haven. It's sad to think that it takes 15 minutes to go into downtown VH from my house in OB that is only 2.8 miles away! One last thing, I hope the SSA can get rid of the miserable lady named Cathy...It's horrible to see her berate her employees and passengers with her crudeness.